Here in Atlanta, zoned HVAC systems are a godsend during the summer. If your home has two or more stories but just one air conditioner connected to one downstairs thermostat, your upper floors can get much hotter than your first floor. And by “much hotter,” we’re talking anywhere from 2 to 5 degrees hotter. Maybe more. Zoned systems solve this problem by forcing your air conditioner to cool the upper and lower floors separately. With zones, you can break out the board shorts, kick your shoes off, and stick a little umbrella in your drink – no matter what floor you’re on! During the day, you might be happy at 76 degrees downstairs – even if that means keeping it at 78 to 80 degrees upstairs. You’re not spending time upstairs, so it’s all good. At night, you might want it to be 75 in your upstairs bedrooms. Downstairs? Who cares! You’re not sleeping down there! Set the thermostat to 78 and forget about it. But you know what? Not all zoned systems are the same. If your house has two or more HVAC systems complete with multiple outdoor units, multiple blowers, and multiple independent air duct networks, congratulations! You probably don’t need any ductwork modifications to accommodate your zones. Your system was designed for totally separate HVAC systems. You’re set. Another good way to design a zoned system is with a variable speed air conditioner (and furnace) paired with a variable airflow blower. You get dampers installed inside your ductwork, send air only to the areas that need it, and rest assured that the system will deliver just the right amount of air to heat or cool the space. It’s what variable speed systems are designed to do. Then there’s poor zoning design: standard, single-stage HVAC systems with dampers in the ductwork. These systems are often set up the same as variable speed systems with zones. However, since it’s a standard system with only one speed, you’re bound to experience problems. Remember blowing into a straw when you were a kid? If you covered up part of the other end of the straw, the pressure inside it built up. This put some stress on your lungs and made you work harder to blow the same amount of air through the straw. Well, adding zones to a standard HVAC system creates a similar situation. To send different volumes of air to different zones in your home, your HVAC technician has to install the dampers we mentioned earlier. 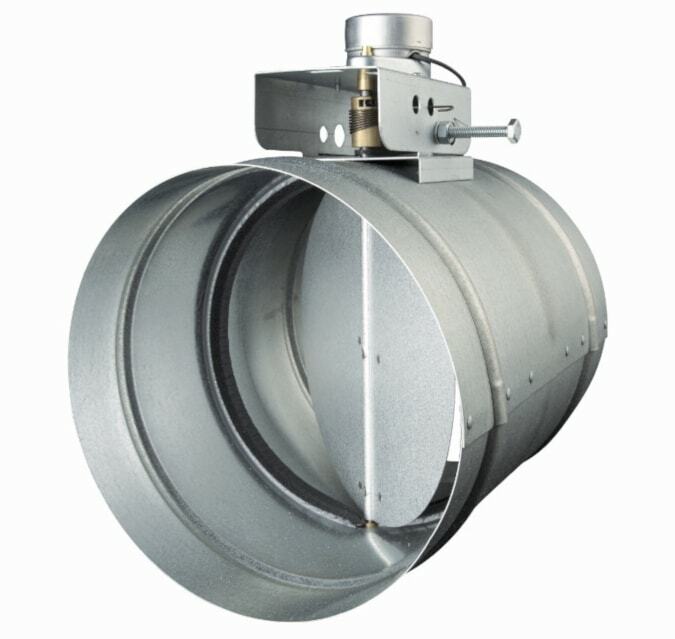 These dampers live inside your ducts and respond to calls for air in different zones, opening and closing as needed. The problem? When dampers are closed in one zone and open in others, your air conditioner has to send lots of air through less ductwork. It’s just like when you covered up part of the straw and tried to blow the same amount of air through it. Except that instead of putting stress on your lungs, the stress is absorbed by your HVAC equipment. Not good. Your system can break down. The excess pressure may force certain components to work harder than they’re designed to. As a result, they can fail. Not only will you be without AC for awhile – you might have to pay for a new blower motor or compressor. Airflow won’t be optimal. You’ll get a whole lot of airflow in the zone calling for air – so much that it might make you less comfortable rather than more! Ever been driving and had your hands feel cold because the AC vent was pointed right at your fingers? Kinda like that. You’re going to struggle with high humidity all summer. Since a standard AC always operates at full blast, it’s going to cool each zone really quickly. That might sound nice, but it isn’t. The system will satisfy your thermostat setting, but it won’t run long enough to remove much humidity from your home. It’ll get noisy. You’re going to hear a really loud “whoosh” while the system runs. You might have to shout for people to hear you. It’s expensive to operate. The large volume of cold air passing through the system will make your coil get colder than it should. A really cold coil is a really inefficient coil. The result? It’s going to cost a lot of money to run your AC during the summer. For these reasons, we never recommend zoning in a single stage system. Ever. To relieve excess static pressure when some zone dampers are closed, you need to redirect the excess air. It would be like poking a hole in the straw while you blow into it to reduce the stress on your lungs. Except that instead of drilling a hole in your ductwork and calling it a day, we install another duct. This duct is called a bypass duct. Inside it, there’s a bypass damper. The bypass duct connects your supply plenum to your return ductwork. The damper inside either allows or prohibits air from entering the bypass duct, depending on the situation. Let’s say you’ve got a two-story home with two zones, one for each floor. When the system is cooling both floors, all of the zone dampers are open so that air can flow everywhere. The bypass damper, however, stays closed. Now pretend you only need AC upstairs. The dampers for the downstairs will close and the ones for upstairs will stay open. The bypass damper will also open, redirecting excess supply air back into your return and reducing static pressure. Does that sound super technical? Don’t worry. Just know that the bypass damper and bypass duct are preventing excess air from breaking things. If you’ve got a standard, single-stage air conditioner and are considering adding zones, be absolutely sure your HVAC contractor installs bypass components. Bypass components can’t fix bad HVAC design. Zoning a single-stage system is always going to be a sub-par design. Adding a bypass is a little better than putting lipstick on a pig, but not by much. The bypass can help you avoid breaking your HVAC system, reduce short cycling, and mitigate inefficient operation somewhat. But it’s still not ideal. If you’ve got a standard system and you’re thinking about adding zones, don’t. It’s better to wait until you’re ready to replace the system and opt for variable speed equipment instead. That way, you can add zones the right way. If you’ve got a standard system with zones and you don’t have a bypass, you need one. Otherwise, you might experience the problems we discussed earlier. Static pressure can and should be measured. Any time you add zones to a single system, be sure the installer measures static pressure for each zone. It should be never be higher than what’s specified in your manufacturer’s literature. You might need a discharge air sensor. If you’ve got a standard system with zones and you’re in the habit of setting your thermostat pretty low, there’s a risk of sending too much cold air to the system all at once and freezing the coil. This little sensor will shut the system down before it gets cold enough to damage anything. The bottom line? Zones are awesome. But you’ve got to do ‘em right. If you’ve got a basic air conditioner that turns on when you need cool air and turns off when it satisfies your thermostat setting, don’t add zones. If you’ve got a system like that and you already have zones, add a bypass. You’ll be glad you did. We often encounter zoned systems with improper bypass components. Other times, a zoned, single-stage system won’t have a bypass at all! These mistakes can cost you big time and lead to a whole lot of discomfort. And if you’re thinking about adding zones and it’s almost time to replace your system anyway, variable speed equipment is the way to go. You’ll be able to enjoy problem-free zoning and all the comfort benefits variable speed systems offer. You’ll also be comfortable throughout your house – upstairs and downstairs – all summer long.